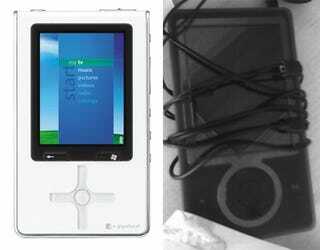 Is The Microsoft Zune Just A Re-Skinned Toshiba Gigabeat? Is the Zune just the Toshiba player with some re-arranged buttons? An insider at Microsoft gives us some food for thought. Stay with us on this. First, Microsoft spun off a good portion of the Xbox 360 team to work on the Zune, including J Allard. They formed a new team called "Pyxis", which is working on the Zune. Since they only had about a year, from the launch of the Xbox 360 to this upcoming Thanksgiving, they were on a very tight, very aggressive schedule. No real time to design a completely new product from scratch. Given Toshiba's ties with Microsoft, plus the Gigabeat's already tight integration with Windows Media Center—and the Zune's apparent Media Center-like UI—it seems likely that the Gigabeat would be the one Microsoft picked to baseline the Zune. Although the button placement is similar, the screen size of the Zune seems to be a little bigger than the Gigabeat. So what do readers think? This is the last Zune piece we'll do this week. Promise!